While the boys sort small change, looking for the Northern Mariana Islands U.S. quarter to put in their coin collection, I grab the tail of this moment for a little post about the everlasting scarf. 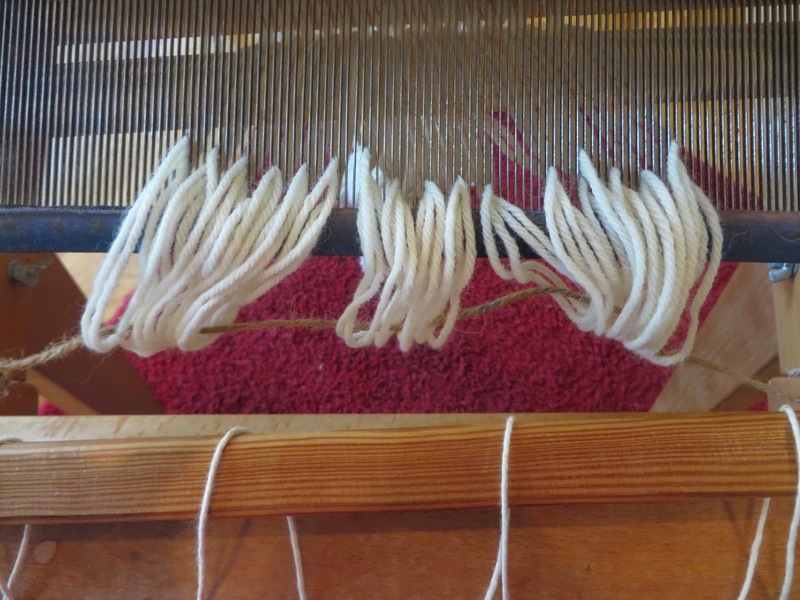 In Swedish methods of setting up a loom the reed is used not only to beat back the yarn into place as new cloth, but is also an aid to spreading out the warp threads to the right width when setting up the warp threads on the loom. 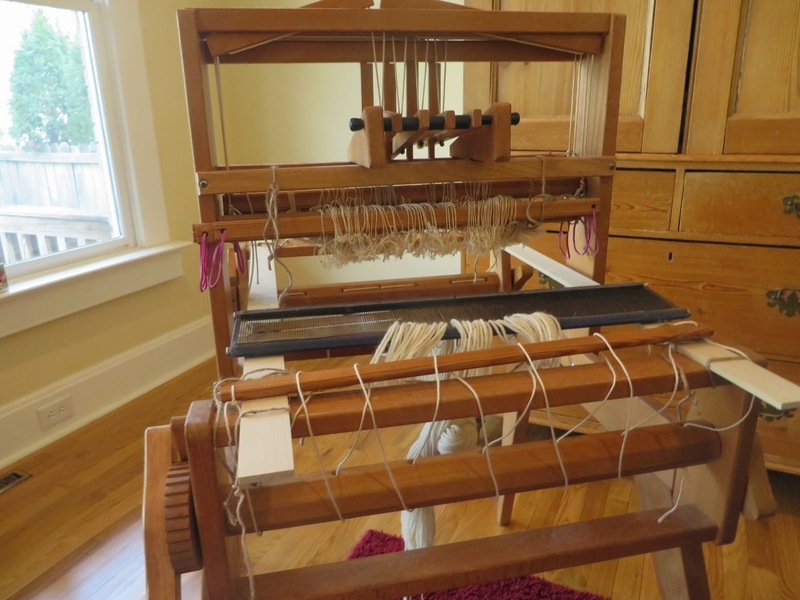 The chained warp threads are temporarily set on top of the loom and each pair of threads is sleyed (pulled) through the reed at a predetermined distance apart so that it can be threaded onto the apron rod at the back of the loom. 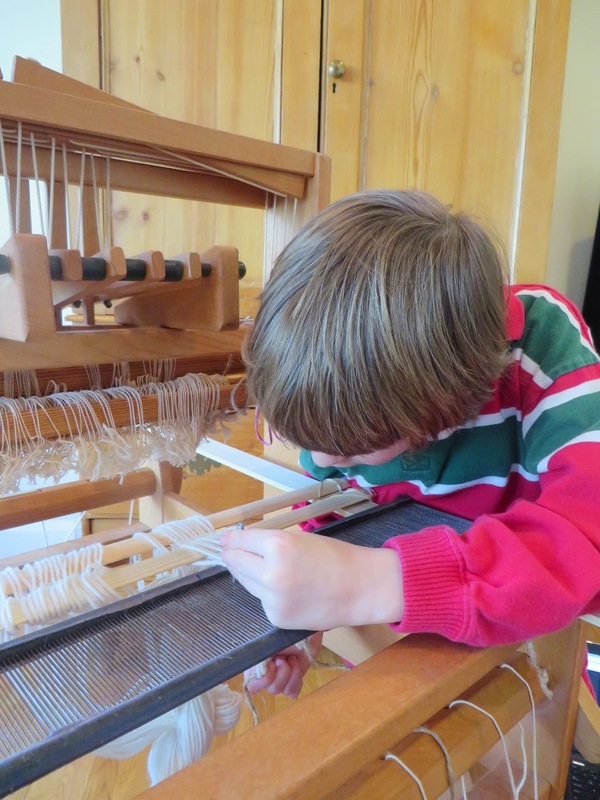 Christopher sleys the warp through the reed as part of spreading it. Warp spread and ready to thread onto the apron rod. That's all for this time. This afternoon we may get a chance to work on it some more, but the boys are each designing a board game for school, and we need to run around some, and I have June's Vacation Bible School work to do...already! Next up, I hope: the Vernet project -- Bernhardt stays! This is very fascinating. 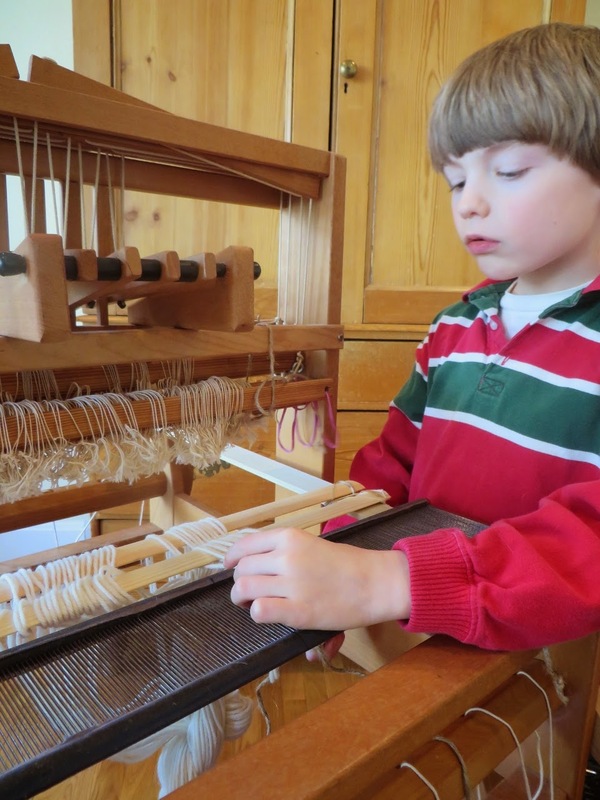 Once a loom is 'running' with it's very own click-a-dee-clack it feels so soothing, but threading it beforehand seems like a real challenge. 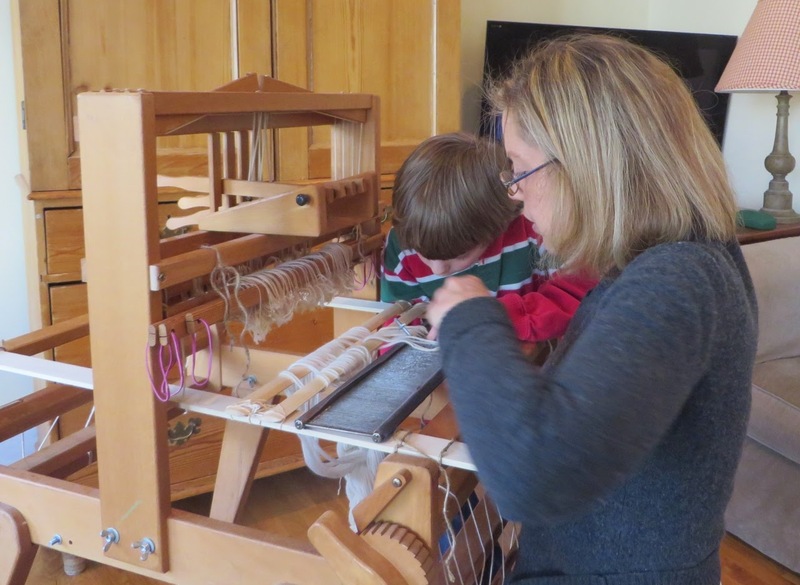 "Dressing a loom", as they call it, can take longer than the actual weaving. 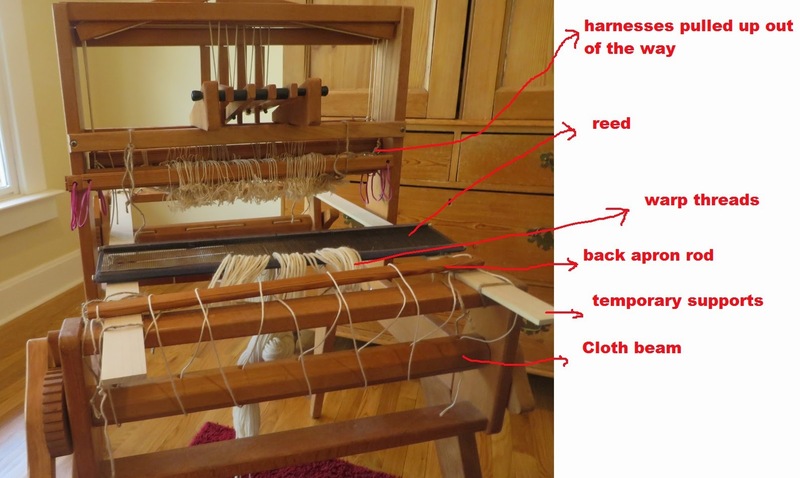 Perhaps that's why weavers often put long, long warps on the loom and then make lots of yards or lots of items in one go. While it's precision work with plenty of room for "oh, no", "oh, nuts", and "oh, #%&+**", it's still absorbing and pleasant. Especially with a warm, kind, interested little boy alongside. Christopher knows that his scarf will be full of his spirit and memories of working with Mama. I like that. Thank you again for the Liebster award! Another blogger awarded it to me some time ago. Therefore, I hesitate to send out the award again, since it would pretty much go to the same people. Again, delighted that you enjoy this blog. One of the central goals has always been to amuse and please readers, to give the both a little of the everday and a little of the out-of-the-ordinary to laugh about or to learn.